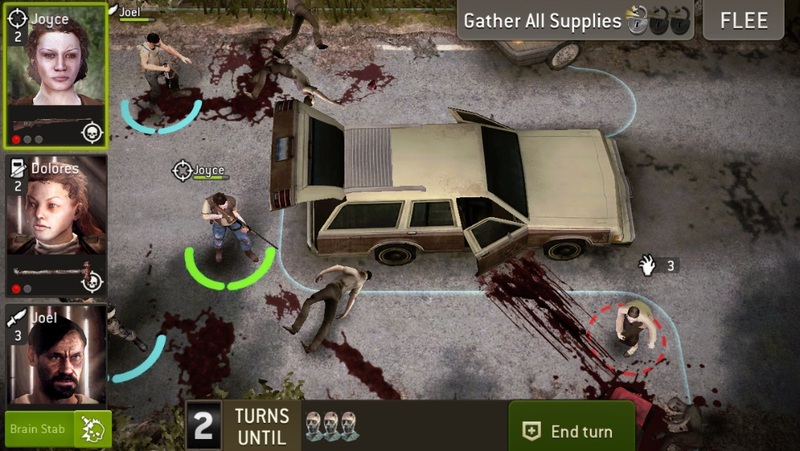 This article about The Walking Dead: No Man’s Land is a strategy guide with tips for fighting and attacking in the app. A few days ago we had already supplied you with a general guide for the No Man’s Land with tips, tricks and cheats. The most important thing in the app are clearly the battles. These are available a number of missions and challenges. Particular attention should be given to the deadly missions, because in the worst case you lose here even your characters, so a good strategy is essential. 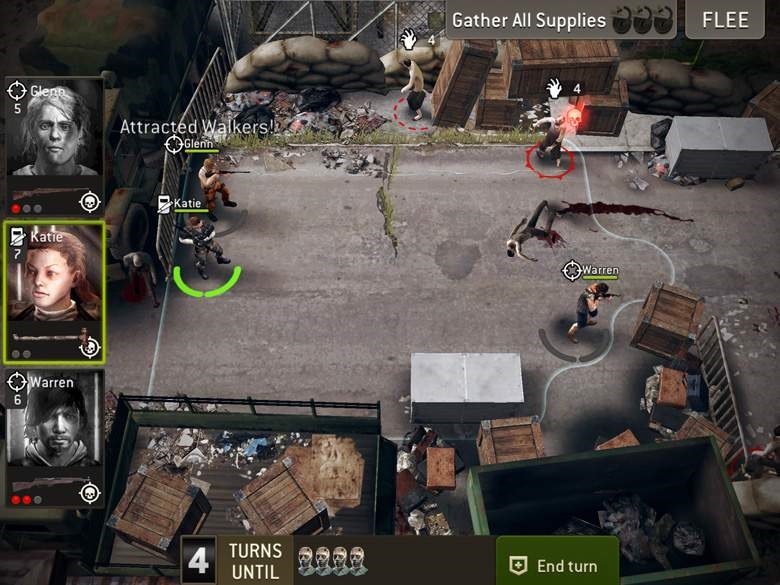 Therefore, we have worked out a strategy guide for this purpose, which gives you some tips to fight and attack in The Walking Dead: No Man’s Land. In the first section we will discuss the basics of attacks and have to some tips ready. Among other things, we also have an effect on what should be done before a fight. 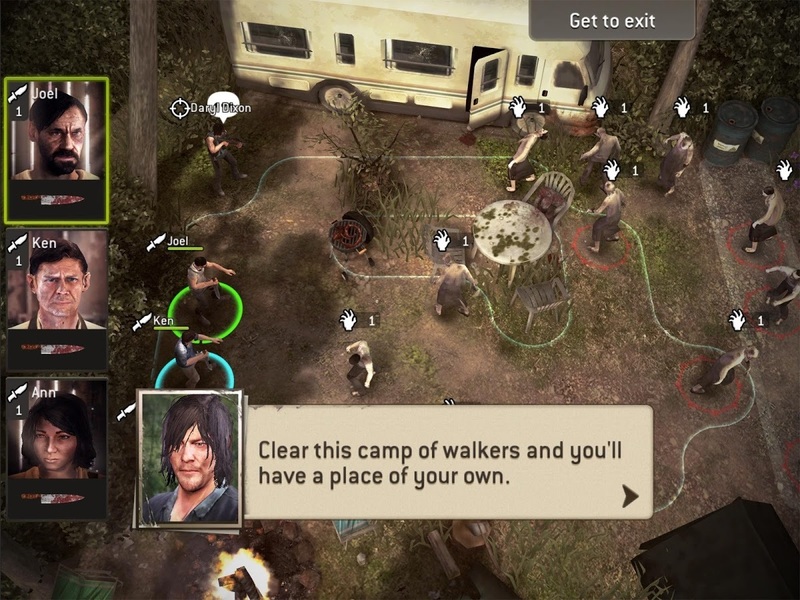 In the second part you will find then our strategy guide for The Walking Dead: No Man’s Land, which supplies you with helpful tips for the fight. Before the attack in The Walking Dead: No Man’s Land, you should note a few things before a fight, that you may not risk a run. It should be noted, that there are characters that are healed or upgrade and can not be used in the team. Always place the best weapons and equipment for the corresponding character. You just tap in the camp on the icon with the heads and then press the respective person. Here the weapon and armor can be selected. Workshop: Upgrade the weapons your characters have currently to do more damage or have more defense. Training Ground: Upgrade your characters for more damage and defense. Here you also have to regularly improve the training ground, so that your characters can be upgraded to higher levels. To upgrade you need experience points. After you have heeded our advice for the battles, it now applies to select the best characters for the attack. At the beginning there are three types available, if you have completed Episode 4 successfully, the shooter will be added. Every fight type has it advantages and disadvantages, so you should think twice about how to put together your team. First, an overview of the character types in The Walking Dead: No Man’s Land. 3 hunters: All hunters are very good when a large group of walkers appears in the Mission. Not recommended if armored walkers or many individual walkers are in the battle. 2 hunters + 1 bruiser: Slightly modified, you can also go with 2 hunters and 1 bruiser in the attack. The bruiser can stun individual walkers, which then can be eliminated. If you know another good team compilations for the best characters in The Walking Dead: No Man’s Land, then simply write in the comments. Setup your team with the best characters in The Walking Dead: No Man’s Land : Recommended are at least two hunters. Now that you’ve made the preparations for the attack in The Walking Dead: No Man’s Land, it is now time to fight. Our Strategy Guide contains numerous tips that we’ve learned in the course of time. Our recommendation is to go with 2 or even 3 hunters in the missions, as you can eliminated large groups of walkers with them easily, as they often appear in large numbers. First, we have a tip for the hunters in The Walking Dead: No Man’s Land. Here you should not directly touch a walker to be shot, but you should first use one AP to bring your hunter in the correct position. Whether to get away from the walkers a little or get a better position to shot. If you would stay at your current location, you could kill a maximum of 1 walker. If you change your position, 2, 3 or even more walkers can be killed or at least wounded. The place on the screen of The Walking Dead: No Man’s Land is just small, because you can not quite zoom out. If you’re now use the one AP, you can still see on the screen and so put the shot to the next walker. The advantage is that you so clearly doing more damage, if you were set this as a guard or if you are using 2AP and thereby can not even get a shot off. Another tip in The Walking Dead: No Man’s Land is to setup guards. If you use only one AP (so still a green bar is to see around the character) and you then tap”End Turn”, then the character gets in position as a guard. The big advantage is that (if a walker is nearby) the guard is always attacking. The melee scouts and bruisers must stand near by while the hunter a greater distances is possible. However, the damage is not quite as high as a normal attack. If it get’s complex or particularly strong walkers appear in one place, you can use the following strategy: Simply don’t alarm any opponents. For this you either get far enough away. Hunters should not settle shot, because so also walkers can be lured. Among other things, you can move closer to the opponent or avoid the fight, when it comes to armored or strong walkers. What we had overlooked for a long time in The Walking Dead: No Man’s Land, were the special abilities. Has the character killed a corresponding number of stray animals, so you can perform a special action. This should, however, you should use strategically. Furthermore, these special actions are unlocked only above a certain character level, so you have to upgrade your characters to use them. Most hunters have the special action called “Critical Attack”. With this you can do critical damage, with which walkers can already be killed, otherwise this would not be the case. To activate the special attack, you need to tap the green button of the respective character, which then begins to glow. By tapping on the top left on the green button, the special action will be activated. If you have opened all the boxes (or whatever was the target), then you do not necessarily go into the target area. Here it is recommended, that if one character still has enough health, easily to stay with a character in front of the goal. Now you can continue to kill the rest of the enemies, for example, with hunters. Since they do this from a distance, there is no risk. Once the walkers in The Walking Dead: No Man’s Land get to strong (with each new wave the level increases) you can just go to the goal. The big advantage: You can thereby again gather extra experience points, which are necessary to upgrade your characters. If you are close to finish at a fight, leave a character close at the end and kill the next waves without taking the risk to get killed. If you have more tips, strategies and guides around the The Walking Dead: No Man’s Land, then simply write in the comments. Since the battles always takes place against predefined missions, please feel free to ask for serious missions, like other players have done them. Not always hunters at The Walking Dead: No Man’s Land must be the key to success. This article is part of the series The Walking Dead: No Man’s Land Guides. 10 Comments on "The Walking Dead: No Man’s Land – Strategy Guide"
Good read. I’ve been playing for a while now and I still don’t know the point of the shooter class. Anyone have a clue? You and I clearly dont play the same way, as I almost always have two shooters in my team (waiting to get the assault class and/or a second warrior). I use them almost exlcusively in overwatch mode to cover my scout while waiting for them to charge their free attack, which does not attrack an extra walker, and then use that attack. It gives me 4 shots every 3 turns per shooter, and since they are my characters doing the highest damage, I can easily complete stages with my team being 2 levels under the recommanded level. Not really. I rarely use them/ I’m big on strong scouts and hunters. I haven’t gotten to the next class yet. In lakeside. Shooters’ specail ability are to be able to shoot twice in a single round after they have killed a few walkers in a given mission. Usefull when walkers are close but not in a single clump. I like to run two hunters, and a shooter. The hunters do the killing, while the shooters opens items. With the shooter charged, he/she can pick off 2 walkers that arent lined up for the hunters. Has worked through Ep. 12. I’d like to see more balancing for the other classes to make them more effective. any advice for episode 8 mission 2? can anyone give me advice on how to pass episode 9 mission 4 no matter who i use or what i do i always end up dying even though i get to the lit up green zone…..
Level 7 final battle has no chance of victory!!!! I tried everything and to no avail no way to finish this game!!! !